High School Assistant (Tamil), Junior Language Teacher (Arabic)- LPS, Part time High School Assistant (Arabic/ Hindi), Part time Junior Language Teacher (Arabic/ Urdu)- UPS/ LPS vacancies. Kerala KPSC has released total 55 Lecturer, Teacher, Assistant Professor Jobs. Candidates interested for these Kerala PSC Recruitment vacancies may go through the web link @ www.keralapsc.gov.in. Apply for the selected post through online mode before 6th December-2017. Selection of the candidate applying for KPSC Teacher/ Lecturer Jobs is based on academic qualifications and followed by online test. Detailed information regarding Educational Qualifications, Age limit, Pay scale, Application procedure, Examination fee, Exam pattern, Syllabus of Kerala Public Service Commission KPSC Part Time Junior Language Teacher (Urdu/ Arabic), Nursery, Drawing Teacher, Lecturer Jobs Recruitment are mentioned below. Last date for submission of KPSC online application form: 06-12-2017. Please go through the Kerala PSC Official Notification for Pay Scale details. Detailed Qualification info for each post are given in the Kerala PSC Notification. Candidates will be selected for Kerala PSC Lecturer, Teacher, Assistant Professor Jobs based on their qualification percentage and Online written test. Detailed info regarding Admit Card, Exam date and syllabus details, check the Kerala PSC Notification. Candidates with the above eligible criteria may go through the Kerala Public Service Commission official website www.keralapsc.gov.in and apply for specific post. Last date for sending application form is 6th December-2017. 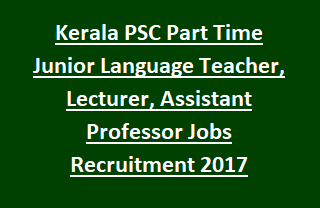 Apply online for Kerala KPSC Nursery/ Drawing/ Part Time Junior Language Teacher(Arabic/ Urdu) Recruitment Vacancies 2017.